The symbols on the map are the simplified tokens of Landscapes. Well-designed symbols can help us to recognize landscapes effectively when we are using the map. And while we are designing a map, sometimes we will find a few differences between the symbols usually used and the default symbols provided by software. If we want to create or to insert unique symbols, we can now use a built-in tool of SuperGIS Desktop- Symbol Composer. 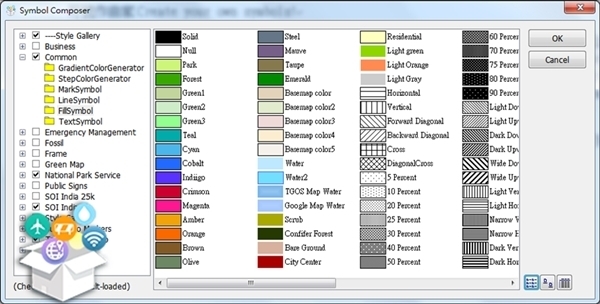 Symbol Composer is a distinguished tool that is independent from SuperGIS Desktop, which means that we don’t even have to execute it through SuperGIS Desktop. All the symbols that we need to create a map can be browsed, adjusted, added or deleted directly in Symbol Composer, which includes mark symbols, line symbols, fill symbols, text symbols, step colors, or gradient colors. Now, let us take a look on how can Symbol Composer assist users to create customized symbols. In this article, we will take the overweight issue as our example topic. Overweight is a common disease for modern people and also a well-noticed issue recently. The popularity of fast food culture is considered as the main reason for the universal overweight. Therefore, this article takes the example of fast food stores mapping to explain how Symbol Composer could deliver more precise information for our map. First, we add a new style named “FastFood”. Then we will find several folders in every style, which includes mark symbols, line symbols and other symbols mentioned previously. Since fast food chain stores were often presented as point features, we need to open up the “MarkSymbol” folder for creating new symbols. 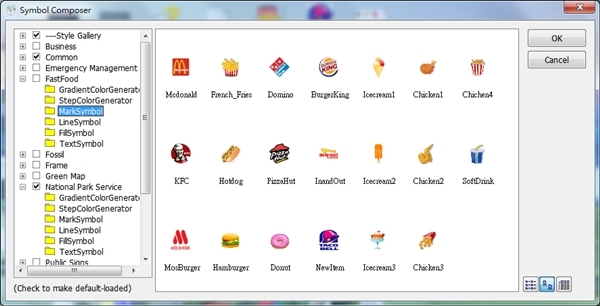 After inserting common symbols of fast food chain stores, click OK for saving the customized symbols. 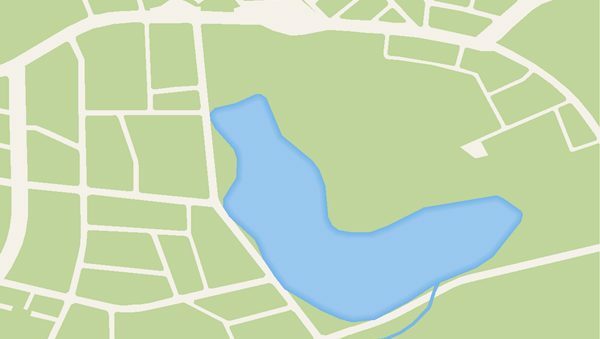 We can now execute SuperGIS Desktop to create maps with customized symbols. 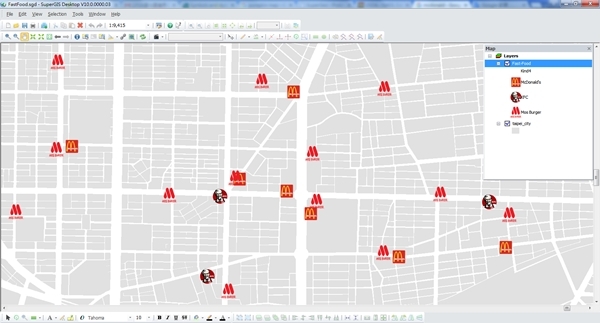 According to the different attributes of fast food stores, we can now create a fast food stores map with the symbols just created by Symbol Composer. Except point layers, there are also various options for line or polygon layers that allow users to adjust symbols. Taking line symbols for instance, we can also add some images for fitting real landscapes instead simply adjust the color and the width of lines. While customizing fill symbols, we can use gradient colors or shades to present different textures or conditions of polygon features. Finally, as the customization is all finished, we can click OK to save our symbol files for later uses. We can also share the saved symbol files with other users for greater convenience.